GRAVENHURST, ON – In what may be the first intercontinental brewing collaboration to feature a Canadian brewery, a beer co-created by Sawdust City Brewing will soon be on grocery store shelves in Norway. 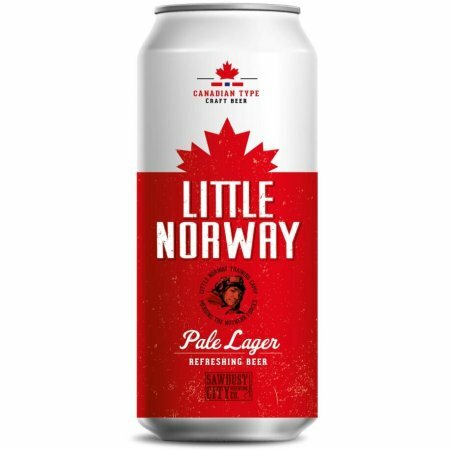 Little Norway Pale Lager was developed by Sawdust City brewmaster Sam Corbeil in conjunction with the brewers at Arendals Bryggeri, an employee-owned brewery located in the town of Arendal in southern Norway. The beer was commissioned by Scandza, a company that works with various manufacturers to create food and drink products that it markets throughout the Nordic countries. According to Corbeil, Scandza “wanted this beer to have a Canadian theme – apparently Norwegians think very highly of Canadians,” and contacted Sawdust City owner Rob Engman via a web search for “Canadian beer”. Corbeil and Engman traveled to Norway last year and met with Scandza and Arendals representatives to taste a selection of Sawdust City beers and develop a recipe for a collaborative beer to be released in the Norwegian market. We elected to make a hoppier version of the Kölsch, and being that Arendals is a lager brewery, we used lager yeast for simplicity. I worked with their Brewmaster and then sent them a recipe for the beer. It’s very similar to our Kölschbut with Saaz hops instead of Spalter and a lager yeast instead of an ale strain. We also worked with Helen Knowles at Gilbertson & Page and brewed the beer with 100% Canadian 2-Row malt from her line of O-I-O malts. Lastly, Scandza also felt that the style Kölsch wouldn’t really resonate with the Norwegian crowd so they called it a pale lager. The beer is 4.7% abv, as all beer sold at the grocery store level in Norway must be under 4.8%. During WWII Norway sent their Air Force over to Canada to train. They started in Toronto, but after a crash in the city, they moved them up to Gravenhurst to avoid a major catastrophe. They trained there for a few years and now Gravenhurst has a memorial museum at the local airport called “Little Norway”. The King of Norway has actually visited the site and has his name singed in a rock there. This was completely serendipitous. I’d lived in Muskoka my whole life and hadn’t heard this story. Seriously, it just worked out. Little Norway Pale Lager will be available at approximately 1500 grocery store locations in Norway. If successful, there are two more brands planned to come from the partnership – a summer wheat beer similar to Sawdust City Golden Beach Pale Ale made with Canadian barley and wheat, and a Winter Maple Bock using Canadian barley and maple syrup. I stumbled upon this in a Norwegian shop today and decided to try it, to great satisfaction. It’s definitely a Pale Ale for the summer, with its mild aromatic freshness. I’m happy that I tried it and I’m certain that I will return to this excelent lager in the coming months. Thanks and skål! Worst crap I have ever tasted, simular to Budweiser, its just so watery and thin. Its like water. This beer ruined my night. Awful.